The lucky-food lore casserole is a deep dish, indeed. World over, New Year’s eating, whether that’s a Theravidin Buddhist New Year celebration in April, a Jewish Rosh Hashanah in the Fall, or Western-culture parties January first, festivities are rife with symbolism. Traditions vary, but, definition-wise, “good luck” long ago entwined itself with “prosperity.” So if it looks like money–silvery fish, greenback greens, coin-shaped legumes, sweets or breads, you can be sure some culture’s eating it at the start of the new year. Potfuls thought to be propitious at this juncture include foods that you have to eat a lot of to make into a meal, or, that swell as you cook them, such as rice, lentils and pasta. Of these in America, black-eyed peas are the Southern favorite. Also known as cowpeas, black-eyed peas are thought to have originated in North Africa so long ago, they were a staple of ancient Greek and Roman diets. They came to America with Spanish explorers and African slaves and started appearing in cookbooks in the 1840s. 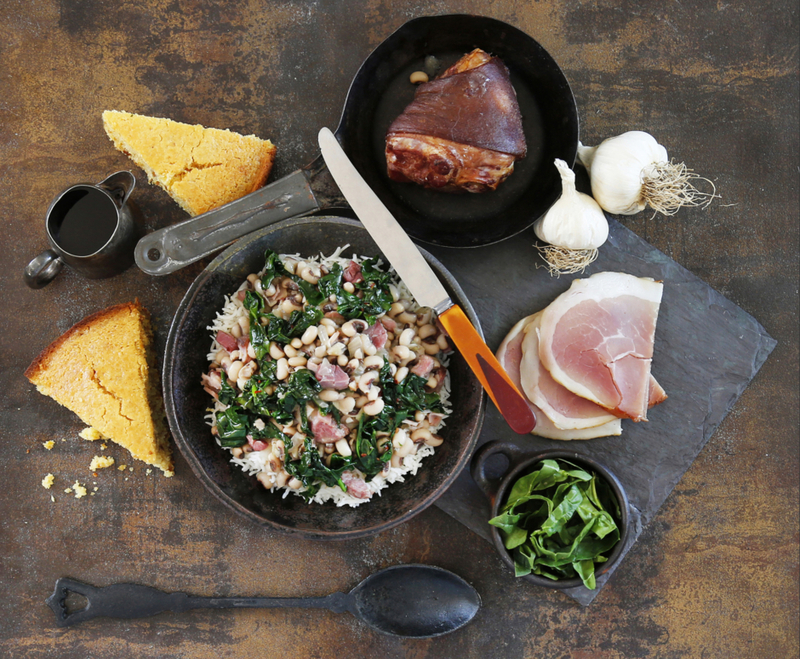 Enriched with pork (or smoked turkey necks) and served over rice, with greens and cornbread on the side, the peas become Hoppin’ John (etymology unknown), a cheap, soul-soothing nutritious meal of the most comforting variety. Make the beans: Soak the beans in 4 cups of water overnight in the refrigerator. Drain the water. Place the soaked beans in a pot and add one of the large onions (quartered into chunks), and the ham hocks or turkey necks. Add the turkey or chicken broth. Heat to boiling; immediately reduce heat to maintain a low simmer and cook for 45 minutes to 1 hour until beans are tender but not mushy. Pluck out the ham hocks and onion; set aside to cool. While the beans are cooking, start the rice in the rice cooker and make the cornbread from the recipe link in the body of the story above. Make the mix-in: Dice the remaining onion and entire head of garlic (about eight cloves). Warm the oil in a heavy-gauge saute pan over medium-low heat. Add the onion and garlic and saute for three minutes. Add 1/2 cup of water or chicken broth to the mixture and cook until soft. Remove to a bowl. Wipe out the saute pan. Once the onion and ham hocks from the bean pot are cool enough to handle, remove the meat from the ham hocks and dice along with the bean pot onion and add them to the onion and garlic mixture you reserved in the bowl. Add extra diced ham or bacon if desired. Season lightly with pepper. Stir back into the beans. Make the greens:Place the saute pan back on the stove. Remove all of the ribs and stems from the greens and cut into ribbons. Heat the oil in the saute pan with the garlic cloves until the oil shimmers. Remove the garlic cloves. Add all of the greens by handfuls to the pan and toss/stir until the greens are cooked through but not completely limp. (*Note: you may wish to cook mustard and collard greens longer. Spinach and kale may be finished sooner.) Season to taste with a dash of vinegar and pepper. Note: Typical red pepper flakes are a nice addition, but I love Aleppo pepper here--pungent but a bit less firey. To serve, mound rice in bowls, ladle beans over, top with greens and hot sauce. Serve with cornbread.